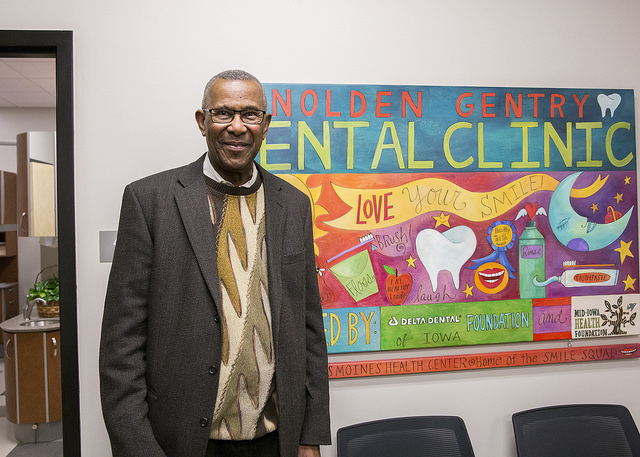 Nolden Gentry stands next to a sign welcoming people to the dental clinic named in his honor at Scavo High School. Rarely does a dental office draw a crowd or inspire enthusiasm the likes of which were on display yesterday at Scavo High School’s brand spanking new Nolden Gentry Dental Clinic. Granted, the occasion was a ceremonial floss-cutting that officially opened a facility that’s been seeing patients for two weeks. Toothaches and cavities weren’t the causes of the SRO waiting room, happily. But the widespread joy and satisfaction were genuine, not ceremonial. The Scavo Community Center is a realized dream shared by many stakeholders, sponsors and partners. There are 26 of them listed on the sign that marks the entrance to not only the dental clinic, but a medical clinic too (see the list below). Representatives from Delta Dental and Mid-Iowa Health Foundation, the principal benefactors that made the dental clinic possible, were on hand to wield the giant scissors that made it official. So was Gentry, the first African-American elected to the Des Moines School Board and a long-time member of the Delta Dental and Mid-Iowa Health Foundation boards of directors. Tuesday’s occasion was actually a two-for-one grand opening. After the silver ribbon of dental floss was snipped on one side of the office a red one across the lobby was cut to formally open the medical clinic that is operating under the auspices of Primary Healthcare. PHC is a nonprofit community health center. According to Lyn Marchant, Scavo’s Community Service Site Coordinator, the medical side will see patients either by appointment or on a drop-in basis, and provide services ranging from treatment of illness to physical exams required for students participating in interscholastic athletics. “And eventually we hope to make its services available to students from all over the district,” she said. The opening of the medical and dental clinic are big parts of Scavo’s work to become a “full service” school, which also includes a day care center for teen parents and a food pantry sponsored by the Food Bank of Iowa. Gentry, the dental clinic’s namesake, served for 42 combined years on the Delta Dental of Iowa board and the Delta Dental of Iowa Foundation board, and 22 years on the Mid-Iowa Health Foundation board. In addition, he was the first African American to serve on the Des Moines Public School board from 1970-1983. He continues to serve on the boards of Delta Dental of Iowa Foundation, the Mid-Iowa Health Foundation, University of Iowa Foundation and Bridges of Iowa.